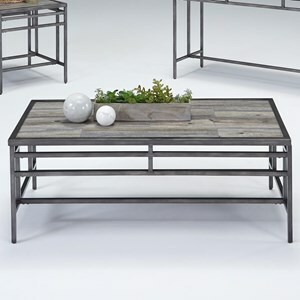 Rustic looking tile resembling wood planks arranged in an offset pattern provide this rectangular cocktail table with durability and relaxed contemporary style for your living room. 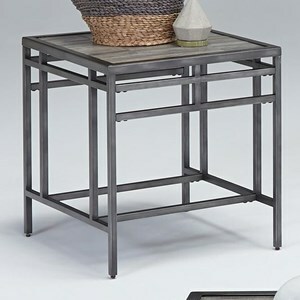 The simple metal base and framed edge in a dark finish complete the table. The Aurora Sofa/Console Table with Wood Look Tile Top by Progressive Furniture at VanDrie Home Furnishings in the Cadillac, Traverse City, Big Rapids, Houghton Lake and Northern Michigan area. Product availability may vary. Contact us for the most current availability on this product. Case Construction Genuine porcelain tile tops. Strong tubular steel legs and support structure in gunmetal finish. Wood look table tops bring the beauty of wood and the durability of tile to the tops of the tables in this occasional collection. The gray hues of the Sky Tile finish complement the dark metal frames. The Aurora collection is a great option if you are looking for Contemporary Casual furniture in the Cadillac, Traverse City, Big Rapids, Houghton Lake and Northern Michigan area.